On Holocaust Remembrance Day, the American Zionist Movement brings UN ambassadors to Auschwitz. 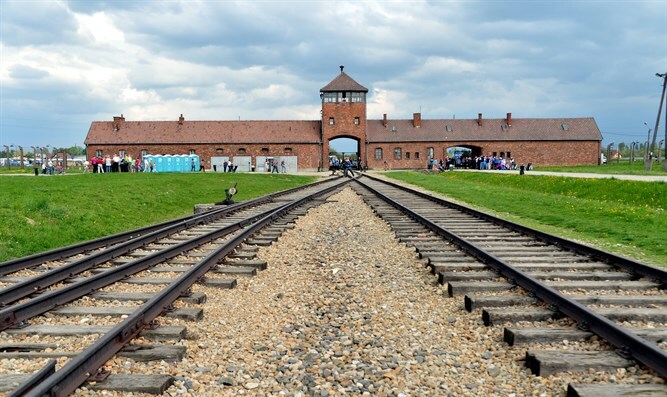 Ambassadors to the United Nations from Africa, Europe and Latin America on Thursday visited the Nazi-Germany Auschwitz-Birkenau concentration camps, participating in the 30th annual March of the Living. The delegation arrived in Poland under the auspices of the American Zionist Movement (AZM). The group is part of a larger group of forty UN ambassadors visiting Poland this week, and will join the delegation in Israel next week for Israel's Independence Day. AZM President Richard Heideman said: "This diplomatic mission takes on great meaning in the year when we commemorate Israel’s 70th anniversary and just recently marked the important role of the UN Partition Resolution on November 29, 1947, an important day in our history." "As many remember the odious Zionism=Racism resolution of the UN, the fact that ambassadors to the UN are marching together in Poland and Israel under the auspices of the American Zionist Movement is especially significant. "This delegation will gain a greater appreciation for Israel’s positive contributions, help improve Israel’s standing within the UN and help build greater ties for the Jewish People among diplomatic leaders from many nations." Israeli Ambassador to the UN Danny Danon said: "As we witness an increase in anti-Semitism around the world, and dangerous attempts to rewrite history, now more than ever we must ensure that the memories of the survivors pass on to the next generation. By joining us on this meaningful march, UN ambassadors from around the world are speaking out against anti-Semitism and sending a message to all those who peddle in hatred." The delegation arrived in Krakow on Wednesday. They toured the historic synagogues and Jewish Quarter, and visited the Krakow Jewish Community Center. They also participated in a Yom HaShoah (Holocaust Remembrance Day) commemorative ceremony, which concluded with the singing of Hatikvah, the Israel national anthem. Hatikva was the song of the Zionist movement, founded in Basel by Theodore Herzl, which last year marked its 120th anniversary. Joining AZM in Poland were leaders of the World Zionist Organization and the American Forum For Israel, the organization for Russian American Jews, as well as players and officials of the Chelsea Football Club in the United Kingdom, which has launched an initiative to raise awareness of anti-Semitism.